"A more compassionate mind is very, very helpful to good health." "Loving kindness, warm-heartedness are keys to health." "Each of us has some responsibility to make a contribution." "You can lead this moment because you practice these things." 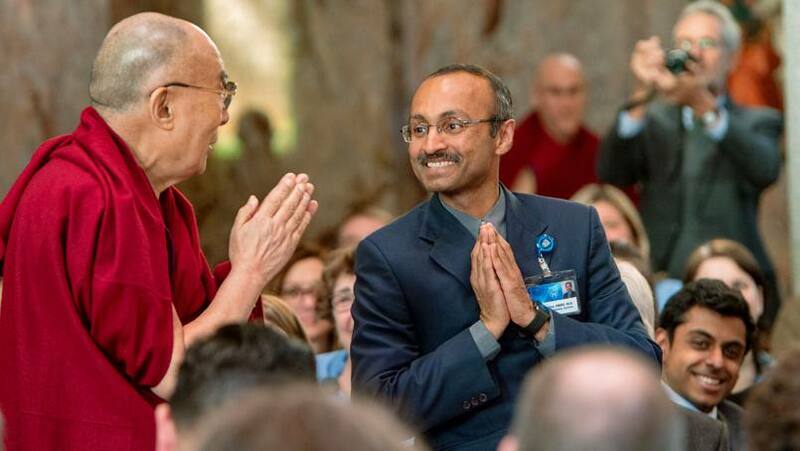 These words from His Holiness the Dalai Lama resonated with Mayo Clinic staff and guests gathered to hear a special talk on "Compassion in Health Care" on Monday, Feb. 29, at the chapel on the Saint Marys Campus of Mayo Clinic Hospital in Rochester. 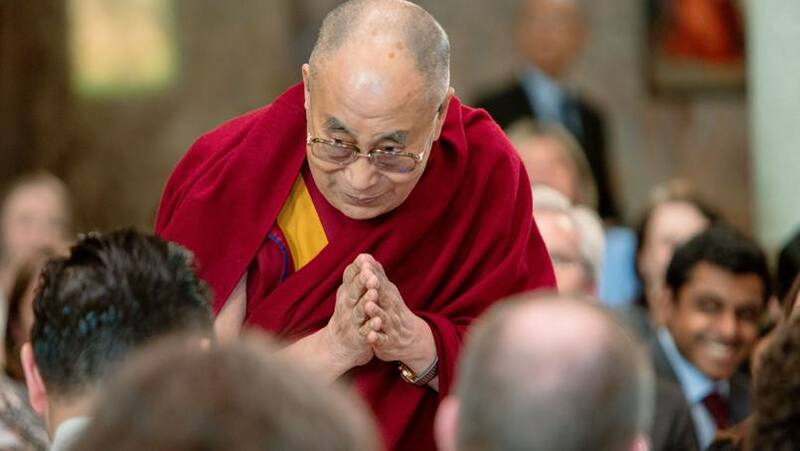 The Dalai Lama's message was especially pertinent in a setting with a strong connection to the Mayo Clinic Value Statements, which include the values of compassion, respect and healing, all of which came up repeatedly in the Dalai Lama's talk and question-and-answer session that followed. Below are lessons from the Dalai Lama noted by some of those attending the session. 1. Treat everyone the same. His Holiness the Dalai Lama spent a good deal of time in his talk emphasizing the "sameness" of all human beings. "Basically, we are the same, human beings, whether different faith, nationality, fate, rich, poor, educated, uneducated," he says. He himself prefers simply to be called "brother." "When someone calls me 'brother,' I feel touched on a basic level of humanness," he says. "Professions are on a secondary level. When a specialist asked how to address me, I say, 'Simply call me brother.' I feel closer." Otherwise, we're creating barriers, he says. "If I put too much emphasis on being His Holiness, I create a barrier ... If I consider my secondary differences as important, I create a wall. In that wall, I am a lonely person." 2. A sense of oneness is important in health care. In a world of 7 billion people, the Dalai Lama says it is important to educate people that we are all human beings. "In today's world, we really need that," he says. "If we put the emphasis on the sameness of 7 billion people (instead of differences), we can reduce problems across the world." He also noted how that sense of oneness already exists in health care. "We have a oneness as human beings," he says. "For people who are working with patients or with illness, that spirit is there. Doctors, nurses and technicians are really very, very kind. Their human sense of friendship is based on love." When we feel anger or irritation toward someone else, it is important to ask ourselves whether that person has been our "enemy from birth," according to the Dalai Lama. Chances are, they were not, he says. "Ninety percent of negativeness is your own perception," he says. "We should utilize our wonderful brains and analyze and look for wider perspectives," he adds. "The same person from one angle may appear irritating, from another angle they may be neutral, and from a different angle they may be positive … When you develop anger, try to look at them from a different angle, from different dimensions." The Dalai Lama offered his advice for dealing with a patient who has received a difficult diagnosis. "Let the person cool down," he says. "Speak nice things to them. Express concern and let the person feel that the person is really taking care of them seriously. Show your serious concern about their well-being." He also noted it was important to be honest with a person about a diagnosis, so that person can be prepared for the consequences. "Let me know the reality and then I can prepare," he says. "Destructive emotions are linked with ignorance – not knowing the reality and focusing on just one aspect of our emotions," he says. "The only remedy is to look at it from a wider perspective. Some part of our curriculum should be to study the map of our emotions and the vast interconnectedness." He also noted that sometimes, all a caregiver can do for a patient is his or her best. "Accept that reality," he says. "Just provide kindness and smile. Feeling of love." "Whether or not you are religious, you are still a human being," he says. "One of my commitments is the promotion of human value." He shared the story of a Catholic monk he met in Spain. The monk had spent five years as a hermit in the mountains with very little by way of physical comfort. He existed on tea and bread. When the Dalai Lama asked him about his meditation, he answered, "Meditate on love." "Without relying on religious beliefs, use intelligence to increase constructive emotions," he says. "In the long run, figure out which emotions are helpful and constructive," he says. He advises people to then familiarize themselves with those positive emotions and train themselves to focus on those emotions. The Dalai Lama suggests that there are two kinds of compassion. Biased: While a person may have compassion and loving kindness, it may be limited to those that they are related to or only people they know. It is oriented toward others' attitudes about them. Unbiased: Through awareness, 7 billion people can come to think of each other as brothers and sisters and to realize that their futures are interlinked. "I have dedicated all my life until my death to try to make a little contribution as much as I can to bring a little inner peace to the entire 7 billion people," he says. "Change starts from the individual. On that belief, one individual's belief will not change the world, but we must start as individuals," he says. "Each of us, part of the 7 billion, should share a clear goal of a happy humanity, a peaceful humanity, through awareness and through education. Practice as individuals and be an example to others. Each of us has a possibility to make a contribution." He concluded by saying, "Basic human nature is loving kindness. Once we understand that, there is hope." "When I think I am a human being, we all are human beings, [there is] no barrier." "Just one person cannot survive. Our survival depends on the rest of our community." "Personal happiness must develop in our mind, not through personal facilities." "The mental level experience is more important than the physical-level experience." "What is the destroyer of peace? Anger and self-centered thoughts." "Anger develops from looking at one angle. Try to look from a different angle." "Trust is the basis of friendship." "The basic human condition is loving kindness." "One individual's effort will not change the world. But we must start from somewhere – from the individual."